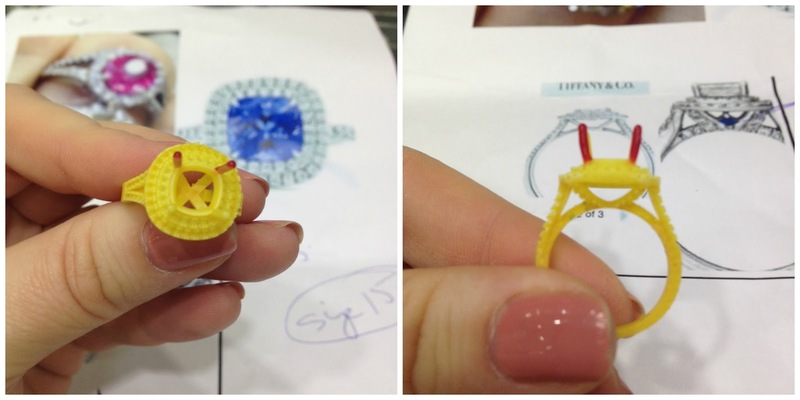 I have never written a post like this before but I recently bought a bespoke ring in Dubai and when I posted the pictures on instagram I had a few requests to do a post about buying jewellery in Dubai so I have tried to put together a post as 'good' jewellery (and by that I mean pieces you want to treasure forever like an engagement ring) is one of the only things I would recommend buying in Dubai that is genuinely cheaper than the UK/US/Australia etc. This is quite a wordy post so please stick with me! Also some of the pictures were taken in the shop on my iphone so I apologise if the quality isn't great. There are two places in Dubai to buy jewellery-the old and more traditional Gold Souk which is in the older part of Dubai and is winding streets of jewellers and definitely worth a visit just for the experience/ambiance and then the newer more modern Gold And Diamond Park which is a small standalone jewellery 'mall' close to the Mall of the Emirates. If you're in Dubai taxi drivers will know both. Buying jewellery in Dubai isn't like buying from a high street retailer in the UK like Goldsmiths where the stores across the UK will stock thousands of the exact same ring or pendant. In my experience, what you see in the jewellery shops in Dubai will be the only piece of that item-but of course they can produce more on demand. By buying from Dubai you can get something uniquely made just for you. I buy from the Gold and Diamond Park because I find it a more pleasant experience-plus you can park outside! I have lived in Dubai for 9 years and have always used the same jewellery shop and indeed the same salesman for all of that time. I used Cara and 'my guy' is called Roger. Cara is rather famous in Dubai and if you look on a travel forum like trip advisor there are a lot of posts. Cara is without doubt THE most popular shop in the Gold and Diamond Park, it is always the shop with the most shoppers inside which I think speaks volumes for their work and their reputation. You can of course shop around, feeling comfortable with who you are dealing with is super important. I have some lovely stories about my experiences with Cara so I thought I would share a couple. My first Xmas in Dubai 9 years ago I was 25 and broke. Setting up here on your own is an expensive business especially when you are on a 'local' contract (ie not one where your employer pays all your housing and living costs). The first week I had been in Dubai a friend had taken me to the G&D Park because she wanted to repair a ring she had. I'd been to the Gold Souk as it's a tourist-y and 'I'm a new expat exploring the city' thing to do but I didn't like the heat, the hustle and bustle and the impossibility of finding a taxi. The gold in the Gold Souk tends to be traditionally more yellow gold and caters to the Arab and Indian market. When Xmas came around I wanted to buy my mum a gift but I literally had £50 to spend and I went to a few of the jewellers in the G&D Park asking if they sold any earrings for my budget only to be turned away. Cara was my last resort and in those days was a tiny shop with 4 or 5 staff. To be honest I only remember the owners, brothers Kiran and Anil and Roger being there. It was quiet when I went in, pretty forlorn by this time but when I asked about gold earrings for my budget they were so welcoming and friendly and I got a pair for my mum. I have been a loyal customer ever since. My favourite story is from my mum and dads first ever visit to Dubai. My mum and dad have been married 39 years this year and my mum has a sapphire and diamond engagement ring that is a cluster of the two stones set on prongs. Two of the prongs had snapped off years ago meaning she had lost the stones as well. She had tried to have it fixed in England but the jeweller she took it to made a complete mess of it and soldered on new prongs on top of the original setting, ruining the ring. My mum hadn't worn it for over 10 years and it was also a little small now. By this time I had bought a couple of things from Cara and we were chatting about their impending visit and my mum said 'I wonder if they could repair my ring'. We took it in and they looked at it and immediately said 'no problem'. I knew my mum was sceptical, I could see it in her face and even I was worried for her, especially as when we were leaving she said to them 'you won't make it worse will you?'. They literally made the ring like new. You couldn't tell which prongs had been damaged, they replaced the missing stones and resized it. They cleaned it all up and it literally sparkled. My mum cried bless her. When she said to Roger 'I haven't been able to wear this ring for more than 10 years' he refused to take payment for the repairs. They're been loyal customers ever since. 1-Go with an idea of what you want. The choice is absolutely overwhelming and the shop can be really really busy meaning it's difficult to browse. I have bought a few 'off the shelf items' but if you have seen a dream ring or bracelet or pendant you would like them to make, take pictures and try to have an idea of the composition of the piece-what size diamond is the one in the picture etc. You need to try and compare like to like when pricing an item. 2-They really can cater for all budgets but don't disclose your budget immediately. Don't think jewellrey shopping in Dubai is only for the rich-something very popular here are name necklaces a la Carrie Bradshaw in English or Arabic. A gold or white gold one made for you will cost you £80-100. 3-Be realistic. Dubai is good for special pieces and I am going to use engagement rings as an example. Don't think you are going to get an utter bargain because the diamonds in Dubai are not fake or knock off. You can expect an internationally recognised certificate on diamonds etc. But in my experience you get better value in Dubai than the UK. 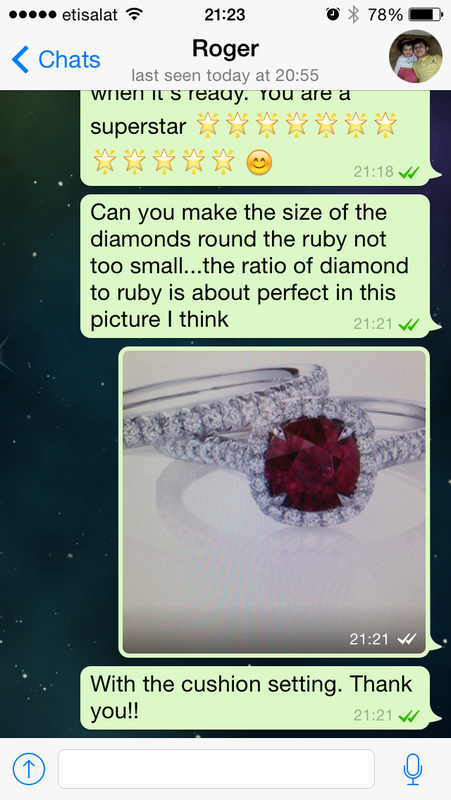 One of my best friends priced up an engagement ring using one of the UK jewellery sites where you can select the cut, colour, size, shape of the diamond you want and she was quoted about £3500. She had the ring made through me in Dubai to her specification and taking some advice from Roger (I helped to chose the diamond which was so stressful because it was so important and we went for a slightly slightly smaller stone but a better colour) and it cost £1750. We were even able to make a last minute change and flatten the band to make the diamond appear higher. And it was absolutely beautiful. The difference in Dubai is that the mark up on gold/diamonds etc is much much less than the mark up in the UK and the cost of workmanship here is much lower than elsewhere in the world. Blue Nile is a great website to use as a guide and they have a very good iphone app. For comparison purposes a round cut, 1 carat, F colour, VS2 diamond on Blue Nile quotes at between $6,700 to $10,000 (depending on whether you go for very good, ideal or signature ideal cut) for the stone only. My jeweller has quoted me for the same stone with a 'very good' cut at $5,500. Please remember this is an example and that they can cater for smaller budgets. 4-Don't expect to get the best price immediately. But DO NOT BE PUT OFF by the prices quoted on the piece of jewellery itself. I swear they pluck these figures out of the air! I have found a good rule of thumb is to divide the price on the sticker by 4 and aim for something around there as the final price. It won't always work that way but doing your research will help so you know approximately what to expect, and having a great sense of humour and being prepared for some banter/negotiation. 5-Ask to see the certificate for the stone, that will never cause offense. 6-Look for older salespeople in the shop (they will usually be male in Dubai), they're generally the most knowledgeable and have been in the industry the longest and you get less of the sales spiel. 7-Leave plenty of time. If you're on holiday and want something making allow 3 days, more if they need to search for a stone for you. You may need to go back to the shop twice, once for a fitting and any minor adjustments and then to pick it up. Some jewellers will deliver to the hotel, Cara do. Cara often has a large stock of diamonds but if you are looking for other gem stones they may use an outside dealer. 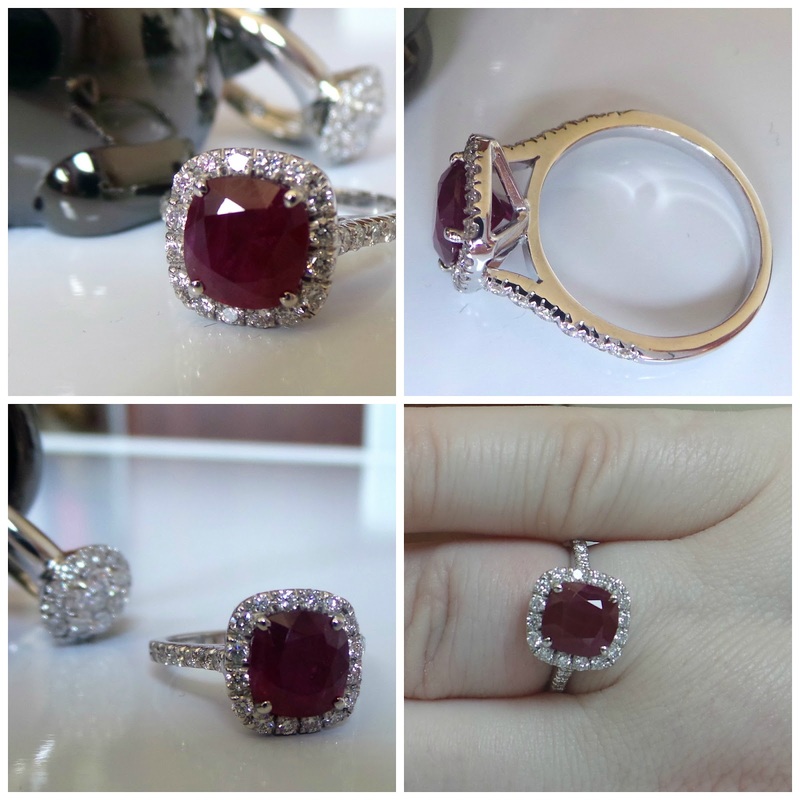 It look 3 weeks to find the ruby I have just bought. 8-If you're buying a bespoke piece you can ask to go to the workshop (which is on site) and see the stone being set. This is especially lovely if you're buying an engagement ring. 9-You won't need to pay anything upfront if you are getting a bespoke piece made for you. You only pay when you purchase. You can pay in local currency (AED) or in USD, GBP or EUR. You can ask them to quote you in those currencies too in negotiations and their exchange rate is always reasonable and close to the spot rate. 10-Cara (and all jewellers in Dubai) are really good at copying famous designs-Tiffany, Cartier etc. Bear in mind with these jewellers you pay a lot just for the name. If you dream of a Tiffany engagement ring but don't have the budget you could get something very similar for a fraction of the price. And made just for you. They can copy pieces from Tiffany etc easily but don't expect it to an 'exact' copy ie to have Cartier engraved inside-that would be forgery and an infringement of copyright. 11-If you're not 100% happy say so! The salesmen in the shop are not the people who actually make the jewellery so if the guys in the workshop have misinterpreted your design or it isn't quite right they will work on it until you are happy. The ring I have just had made took 4 attempts to get right! But I was spending quite a lot and I wanted it to be perfect. If you genuinely do not like your piece of jewellery it is likely it will just go into the shops stock on display and someone else will! 12-Take their advice (I really recommend Roger or Vijay in Cara)-if they say something won't look good it's because they know it won't. 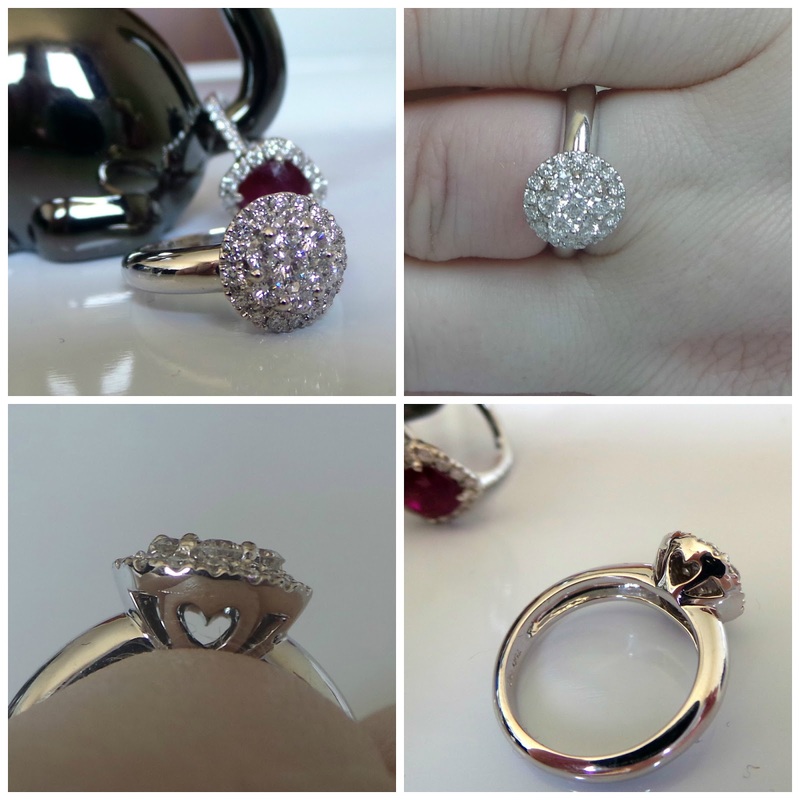 They can advise you on the best way to make the stone look bigger or wider, how 'safe' a setting is in terms of the possibility of losing a stone (because things like that may happen with smaller diamonds especially if they are only set with two claws), how high the stone will sit and help you to pick the best stone in your budget. Here's a little bit about the ring I just had made. If you're a regular reader of my blog you've probably gathered I am not much of a saver. Since I realised a couple of years ago I can't spend all my money on lipstick I have starting 'investing' so to speak in jewellery. When I received my bonus this year I decided to use some of it to buy something that I could give to my niece when she is older. I have two nieces, Violet Grace (6) and Lylah Rose (3) and this time I thought I would get Lylah's ring and get something with a ruby to reflect the 'Rose' part of her name. Don't get me wrong I will wear it now but it will be for Lylah when she is older. For Violet I will get a piece with either an amethyst or a tanzanite to reflect the 'Violet'. I did a lot of research and look my ideas which are largely based on a Tiffany design to Roger. 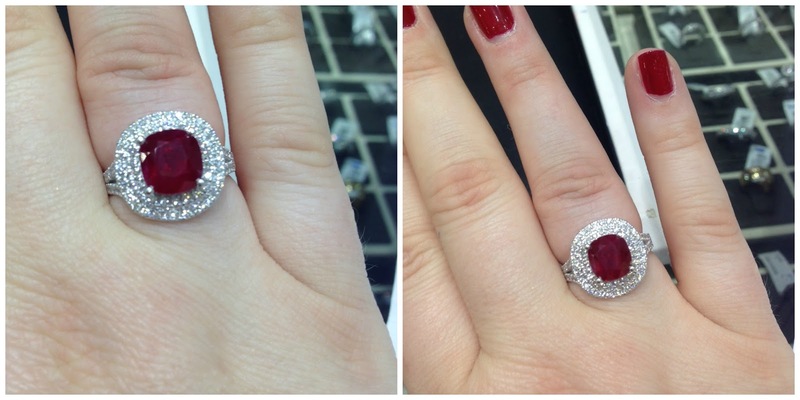 The first thing I needed was the ruby and it took 3 weeks for Roger to find the size and colour I wanted. 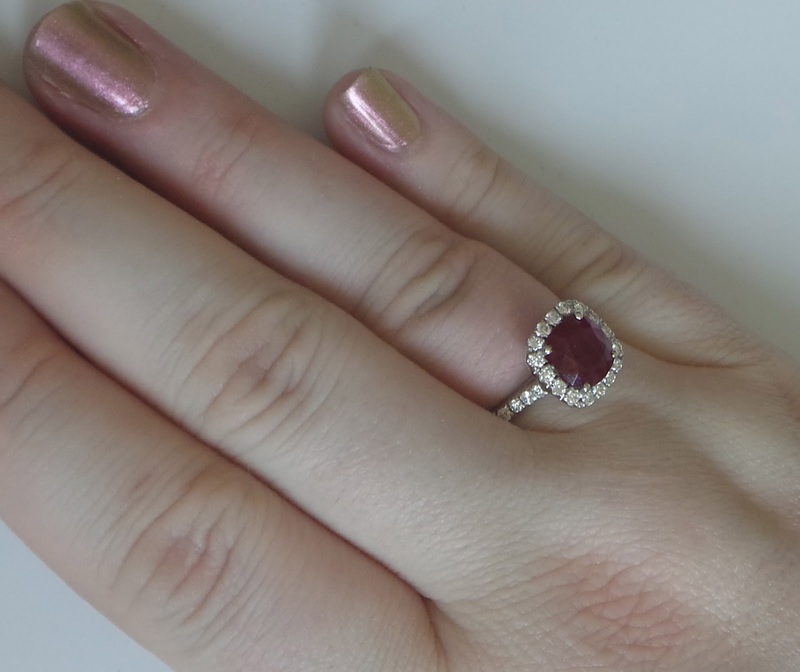 I wanted a pink toned ruby rather than a true blood red ruby and I wanted 3 carats. I also wanted a cushion cut which are quite difficult to find and it's worth bearing in mind that often cushion cut stones are not exactly symmetrical. I looked at several before settling on a 3.16ct cushion cut stone. Initially I wanted a double bead set halo (2 rings of diamonds) cushion setting around the ruby based on the Tiffany 'Soleste' design. However, the first interpretation of it by the jewellers in the workshop was not what I wanted. The halo was too pave, the halo wasn't as 'cushion set' as I wanted, the ruby sat too high and I just felt the ring looked too big and fake. Roger agreed and we sent the ring back to have the halo more bead set with bigger diamonds so the diamonds looked more seperated but with less of them so the ring didn't look any bigger. But the next day I had second thoughts and was worried the ring was just going to be too big so I called Roger and said could we go to a single halo and simple arms rather than the 'V' arms I had first chosen. This was no problem (phew). The single halo and simple sides were perfect-but the claws holding the stone were not. Because of the facets of the stone, the jeweller had tried to be extra careful where he placed the claws so that the claws didn't damage the stone. But the result was 4 claws that all looked different and not symetrical so again the ring when back to the workshop to be changed and to a prong setting. I know it's quite difficult to see what I mean about the prongs but it was visible and bothered me! Finally I was happy (actually thrilled) with the result. 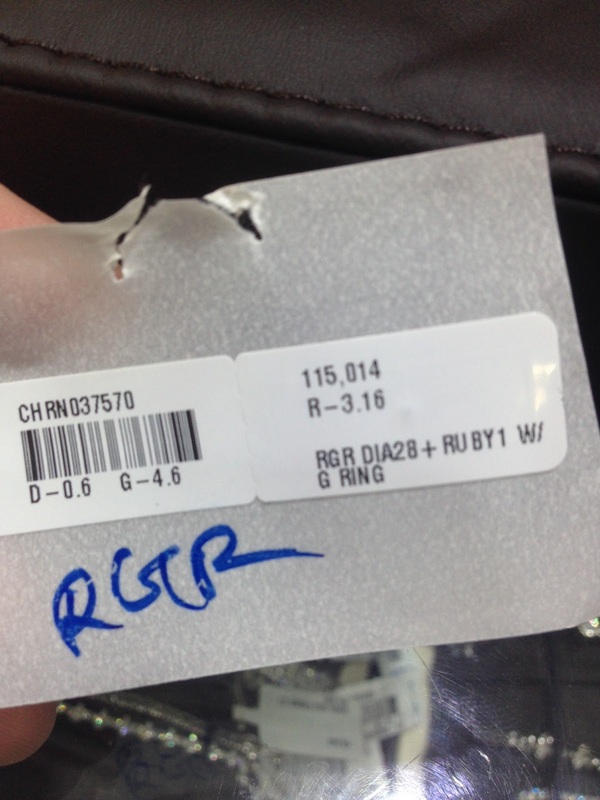 To illustrate my point about not being put off by the prices on the label, I noticed Roger had actually produced a label for my ring, presumably to put it in their stock if I didn't like it. The price is in local currency but literally seems to be a number pulled out of the air. I have never understood why they do that here in Dubai. Aim roughly to pay a quarter of the price on the label but always ask the salesman what the price is-it definitely will not be what's on the label! The day I collected the ring it also happened to be 9th anniversary of me landing in Dubai and I ended up picking up this diamond cluster ring off the shelf! I really like it and the cluster effect matches a pair of earrings I own already. I only actually noticed yesterday when I was photographing the ring that is has the heart detailing under the stones. 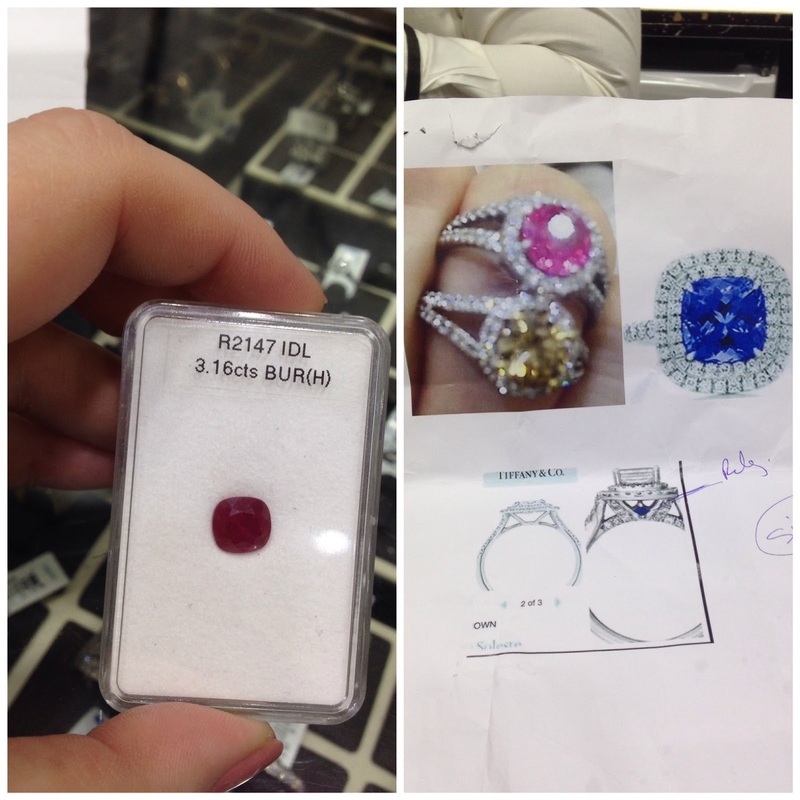 I hope this post has been useful for anyone interested in buying jewellery in Dubai. I do highly recommend Cara, I am such a loyal customer. Please do let me know if you would like any additional information-am happy to help. Cara is in the gold and diamond park in Dubai and they have a website here. They're open every day from 10am until 10pm except Fridays when they open at 4pm. The quietest times to go when you'll get the best service and undivided attention (trust me the shop gets VERY busy) is from 10-12 in the morning and after 8pm. Update: I receive so so many emails about this post and I am always happy to answer any questions you may have but please remember I am not a jeweller, just a consumer :)) I have spoken to Roger recently who has told me many of you have been in and bought jewellery following my recommendations and that makes me super happy! One thing I am always asked is 'if I get an email quote from Cara on a diamond how much room for negotiation is there?' The answer is not much-if you are going to the trouble of getting a quotation Cara consider you a serious potential customer and will close fairly close to the cost-especially as presumably you are shopping around other providers. My tip here would be get all the specifications of the diamond and check out a site like Blue Nile to assess if you are getting a good price for the size, cut, clarity and colour. I am not saying there is room for any negotiation down from there, but the email quote price will not be the 'sticker price' you get in store. Hope that's helpful!! this is a great post!!! what an interesting topic. the internatiional jewel market is pretty facinating. i watched a documentry about emerald miners, buyers and sellers. seeing the jewelry side of it, froma different countries perspective is pretty cool. This post was so interesting. I've re-read it a couple of times... I want Dubai diamonds! I don't have any 'fancy' fancy jewellery - few bits from tiffanys, but no diamonds! It's really cute how you designed them for your cousins! Love this post! Fellow Dubai expat and bling-lover, first-time commenter - just discovered your blog via Instagram somehow. I got my engagement ring done at Cara and have been thrilled, but super interesting to hear your experience doing something a bit more complicated / involved! I will ask for Roger next time I go in... I have a birthday coming up this summer and have a bespoke diamond-studded "Hand of Fatima" pendant dancing through my jewelry dreams, he sounds like just the man to make it happen! Even though I'm not looking for jewellery at the moment, this was such an interesting post. Your new ring is absolutely beautiful and such a classic style :) Trusting a jeweller is so important and if I'm ever in Dubai (I WISH!) I will certainly be visiting this one! Beautiful ^_^ I do love me some sparkles, and although I won't be able to indulge too much while I'm over there the week after next, I would love to go and poke my nose into Cara! I see. Roger seems to know his stuff so I would listen to him. You could always go for a purplish sapphire as well, I guess?